Sudhakar was sessioning for a band called Bourbon Street. They were playing an unplugged show at Herbs and Spices which is located on 80 ft road Indiranagar. Considering that we had to get there at 7, we left home at 6.30 but boy!! was there a deluge of traffic. For simple get-there instructions. Get till the Sony signal on 100ft road and then go down the road OPPOSITE it. Get to the dead-end and you will see a Kaati Zone. Herbs and Spices is above this. The security will guide to securing that elusive space for parking. The restaurant is a cozy place and done up simply. It can seat around 40 people and believe me when I say this - RESERVE your table, walk-ins simply don't stand a chance. The specialty of this restaurant is its menu. Besides a pleasing fixed menu, there are two blackboards, prominently set up that tell you of the house specials for the day. These include tapas, salads and soups, main courses and desserts. The restaurant also serves beer and wine. Now for the food. 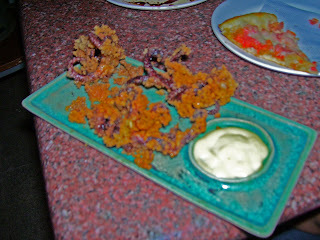 For starters, we ordered the panko crumbed baby octupus which came with a mayo dip. You get around four baby octupuses, whole. Honestly, this was my first time eating octupus and I must say that it tasted like squid, maybe a tad rubbery. But it was good. 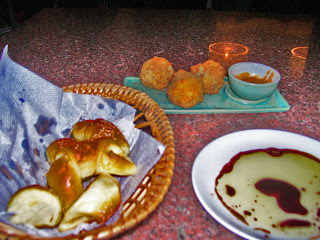 A vegetarian starter was the potato croquettes stuffed with jalapenos and olives. This was three pretty big balls of crispy stuffed potatoes with a tangy sauce and an olive oil/black pepper dip, which made whole dish truly yum. My only wish was that the croquettes be bite sized. 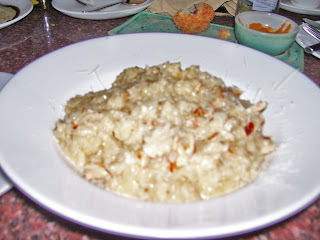 For the main courses, we ordered the chicken rissotto for Anoushka. This was creamy, cheesy and really filling. The chicken shreds though felt like they were fried outside the rissotto and then mixed in. 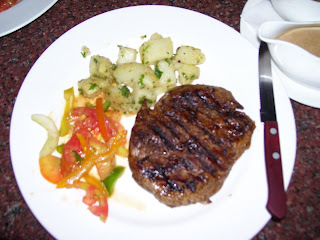 Overall it was a hearty meal, had Anoushka not been on an adrenaline rush and totally disinterested in food. I ordered the Spaghetti and Italian chicken. I normally can't resist ordering spaghetti in any new restaurant that I visit. Though the presentation was nothing spectacular, the entire chicken leg was cooked to perfection. 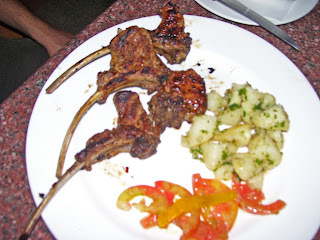 The meat neatly came off the bone and this is often a description reserved for chops. 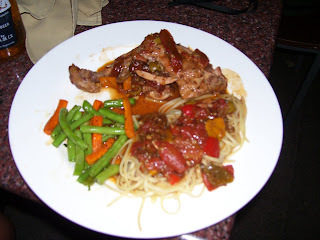 The spaghetti was mildly spiced and infused with garlic, olives and jalapenos. Though after a few bites, you will have more of the garnishing than the spaghetti. Oumkar, our vegetarian, ordered the thin crust freshly baked pizza. This was topped with tomatoes, garlic and jalapenos. And was simply scrumptious. 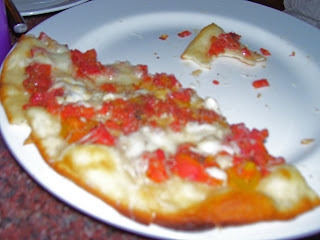 The size of the pizza is quite ovewhelming and can easily satisfy two healthy appetites. Preksha and Chester both opted for the chicken steaks which came with the standard garlic potatoes and salads. And from the satisfied looks on their faces, it looks like they really enjoyed the meal. 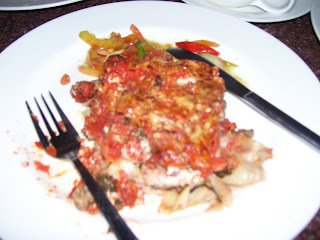 Sushma went for the safe lasagne, which did not really look neatly layered in its presentation and hmmm.... will have to call Sushma for an opinion on it. Fidel went in for the veal chops and by his dedicated determination to clear his plate, it was evident that the meal was great. An order came to us by mistake and it proved that Herbs and Spices does have what it takes when it comes to presentation. This was the prawn version of spaghetti. 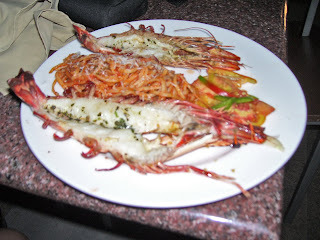 Two entire prawn shells were laced with garlic cheese and minced prawns, while the spaghetti meal came in at the centre. It did look scrumptious but none of us got to taste it. None of us had wine, but we did have ice tea and the house beer - a brand called Corona which was served with a lime wedge at the mouth of the bottle, which I was told was to be pushed into the bottle and gently overturned while holding the mouth closed. It gives a lovely lemony fizz to the beer. Two main negatives The restaurant has a small central pit where around 4 tables have been placed. If it is the rainy season when you visit there, avoid sitting here. This part of the restaurant is covered with a foldable canopy which does not really perform in a downpour. Quite a few unfortunate diners had to scurry for safety. The other is the service. Am not sure if it was the result of a packed house or plain sloppiness, but you will not even get a glass of water unless you ask for it at least a dozen times. Same goes for the complimentary bread basket and your main order and drinks. Put simply, at least our table, literally had to beg for our orders. In terms of costs - the salads, soups and desserts range between Rs 75 and Rs 100. The main courses are between Rs 250 to Rs 350 depending on your dish and whether its vegetarian or otherwise. There are just two unisex loos which are quite cramped but clean. And do not forget to RESERVE your table.